In Bolivia, local markets are the way to go when you want to experience real shopping and feel the local pulse. Each town and village would have its own local market and the stalls that line the streets are a virtual treasure trove of unique finds. Most of the time you can find handicrafts and items that depict the local traditions and culture of the place, as well as sample the local delicacies. So make sure you bring enough Bolivianos (Bolivian currency), your bargaining skills and an appetite for adventure when you hit the markets in Bolivia. 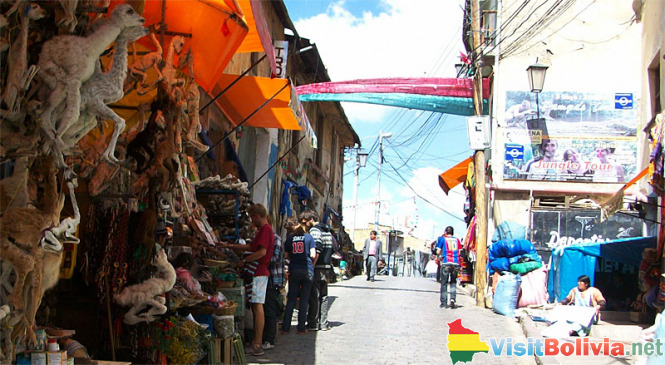 The most popular market in La Paz is the Witches’ Market (Mercado de las Brujas). Here you’ll find an assortment of herbs, folk remedies and ingredients which the local Aymara use in their rituals. The vendors are pretty helpful in telling you where and how to use the wares that they sell. Dried armadillos can ward off thieves and are supposed to bring you good luck. Small figurines of embracing couples allegedly bring you luck in love. Turtles are the symbol of long life and snakes – contrary to popular belief of bad omen – are believed to be signs of progression or moving in the right direction. The most popular item is the dried llama fetus which is said to protect the home. In fact, most Bolivian homes have the dried llama fetus hanging from one of the foundations of the building. At the Tarabuco Sunday Market in Sucre you will find local weavers and you can even take part in the weaving of the textiles. There are also witch doctors that go around and offer coca leaf readings. While browsing around, pick up a bag or two of big dried red chilies and other herbs which can be used for cooking.